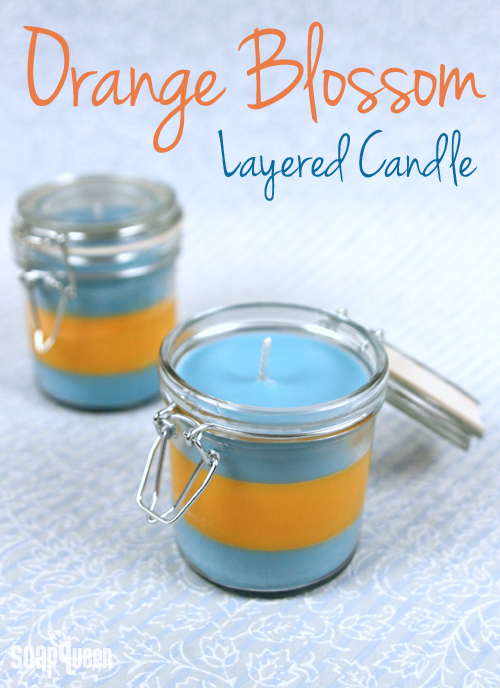 Continuing the celebration of all things summer is the Orange Blossom Layered Candle Tutorial. This cute candle is scented with Orange Blossom (Candle and Soap) Fragrance and screams summer. The tutorial also includes some FAQs about the candle-making process. Scent can make your house smell like summer, and also help your mood. 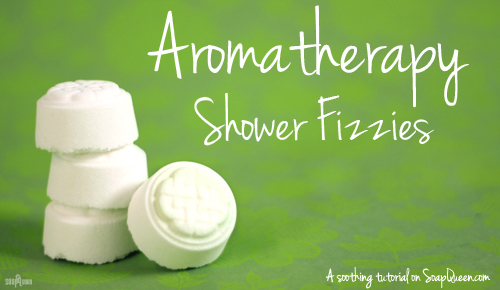 These Aromatherapy Shower Fizzies are scented with several essential oil blends that calm you down or perk you up in the morning. These shower fizzies are like bath fizzies – except you toss them into the bottom of your shower to let the scent waft up and envelop you in its aromatherapy goodness. Okay, I admit it – soap was still in the mix! 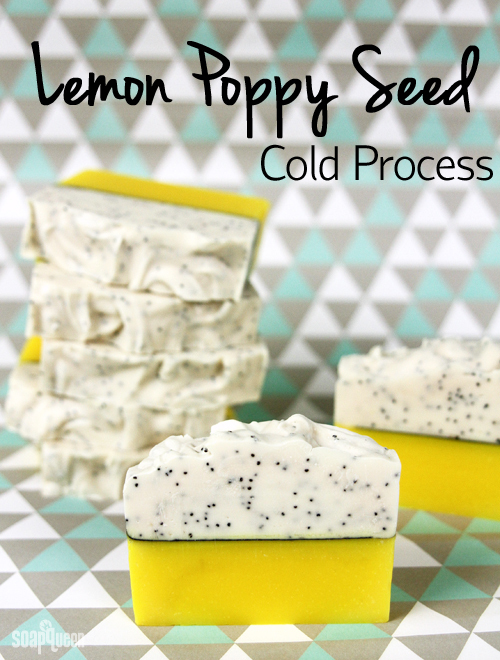 This Lemon Poppy Seed Cold Process Tutorial features a beautiful mica line and poppy seeds for gentle exfoliation. It smells crisp, clean and bubbly thanks to a combination of Lemon Verbena Yankee Type Fragrance Oil and Champagne Fragrance Oil. Yum! In the midst of all the tutorials, our team took a break to get outside and give back in this Sunnyland Elementary Garden Field Trip. Did you know that Bramble Berry supports many worthy non-profits every year? One of them is Common Threads Farm, a Washington-based organization focusing on food literacy, youth empowerment and environmental stewardship. 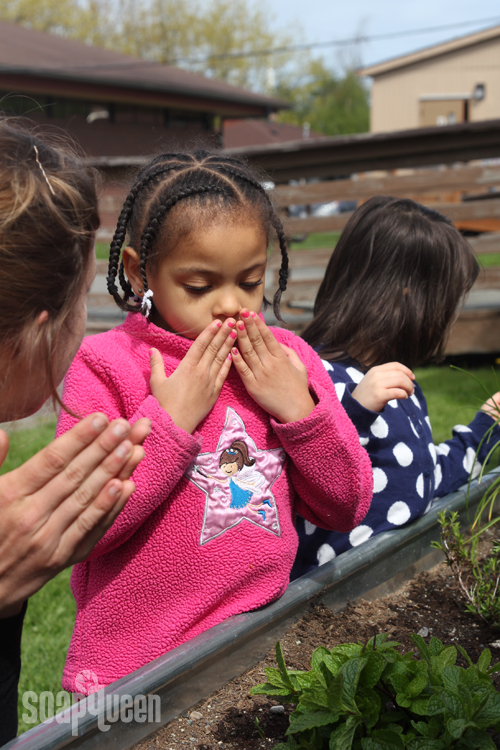 Common Threads brings gardens to schools and community spaces, like Sunnyland Elementary in Bellingham. This week’s Facebook Photo of the Week from Heather with Beautiful Soaps is reminiscent of a garden with gorgeous brown, red, and yellow colors. It’s accented with glitter and scented with Dragon’s Blood Fragrance Oil for an alluring scent with notes of amber, incense and rose. 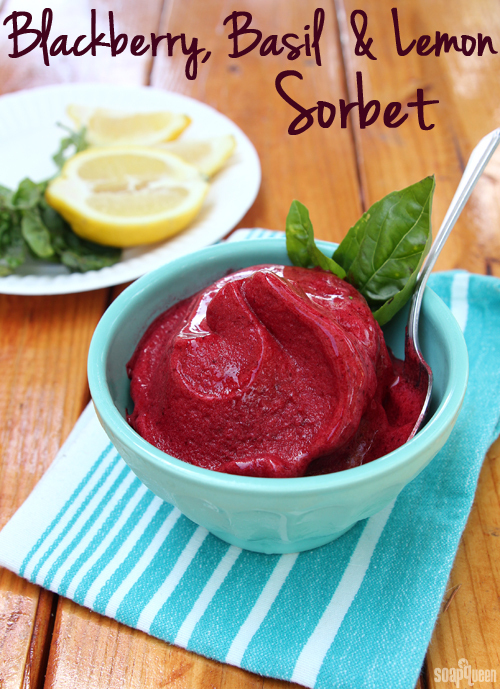 Heather used a hanger swirl to get the beautiful lines in her cold process recipe. If you’d like to learn how to do a hanger swirl, you’ll love the Tiger Stripe “Hanger” Swirl Tutorial. Shown above (top, clockwise) is Heather’s Opium Type Layer Soap, Raspberry Patchouli Soap, and Black Raspberry Vanilla Soap. If you’d like to try your hand at some eye-catching layers, check out this Sunset Ombre Cold Process Soap. Beautiful layers are also possible with melt and pour soap, as seen in this Violet Glitter Gradient Soap. Congratulations Heather! 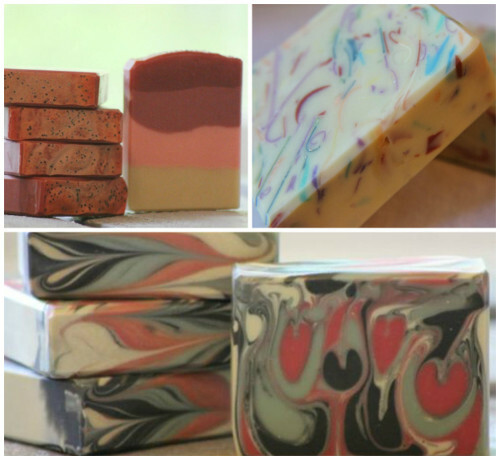 Your soaps are not only beautiful, but give off such a quality look. 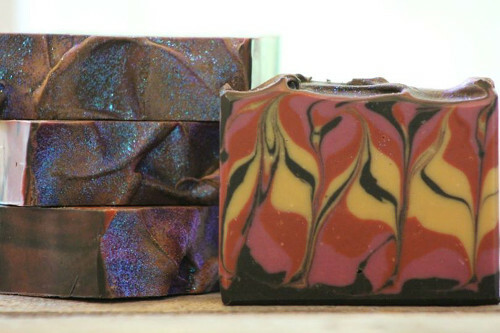 Thank you Bramble Berry for choosing my soap to be this weeks photo! I am beyond thrilled, honored and my heart rate hasn’t slowed down since I found out. I love your “Dragonsblood” fragrance oil. Its gives you enough time to do swirls with the just the right amount of set up to keep your colors separated. Definite winner! I love the soap with the Dragon’s Blood FO, the top looks iridescent with the glitter so it’s almost like dragon skin! Super beautiful!